We had a bunch of questions about vesting in the comments to last week’s MBA Mondays post. So this post is going to be about vesting. Vesting is the technique used to allow employees to earn their equity over time. You could grant stock or options on a regular basis and accomplish something similar, but that has all sorts of complications and is not ideal. So instead companies grant stock or options upfront when the employee is hired and vest the stock over a set period of time. Companies also grant stock and options to employees after they have been employed for a number of years. These are called retention grants and they also use vesting. Vesting works a little differently for stock and options. In the case of options, you are granted a fixed number of options but they only become yours as you vest. In the case of stock, you are issued the entire amount of stock and you technically own all of it but you are subject to a repurchase right on the unvested amount. While these are slightly different techniques, the effect is the same. You earn your stock or options over a fixed period of time. Vesting periods are not standard but I prefer a four year vest with a retention grant after two years of service. That way no employee is more than half vested on their entire equity position. Another approach is to go with a shorter vesting period, like three years, and do the retention grants as the employee becomes fully vested on the original grant. I like that approach less because there is a period of time when the employee is close to fully vested on their entire equity position. It is also true that four year vesting grants tend to be slightly larger than three year vesting grants and I like the idea of a larger grant size. If you are an employee, the thing to focus on is how many stock or options you vest into every year. The size of the grant is important but the annual vesting amount is really your equity based compensation amount. 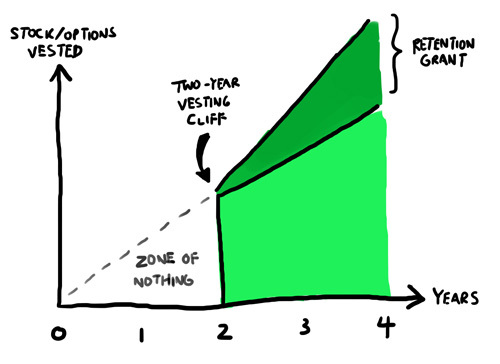 Most vesting schedules come with a one year cliff vest. That means you have to be employed for one full year before you vest into any of your stock or options. When the first year anniversary happens, you will vest a lump sum equal to one year’s worth of equity and normally the vesting schedule will be monthly or quarterly after that. Cliff vesting is not well understood but it is very common. The reason for the one year cliff is to protect the company and its shareholders (including the employees) from a bad hire which gets a huge grant of stock or options but proves to be a mistake right away. A cliff vest allows the company to move the bad hire out of the company without any dilution. There are a couple things about cliff vesting worth discussing. First, if you are close to an employee’s anniversary and decide to move them out of the company, you should vest some of their equity even though you are not required to do so. If it took you a year to figure out it was a bad hire then there is some blame on everyone and it is just bad faith to fire someone on the cusp of a cliff vesting event and not vest some stock. It may have been a bad hire but a year is a meaningful amount of employment and should be recognized. The second thing about cliff vesting that is problematic is if a sale happens during the first year of employment. I believe that the cliff should not apply if the sale happens in the first year of employment. When you sell a company, you want everyone to get to go to the “pay window” as JLM calls it. And so the cliff should not apply in a sale event. And now that we are talking about a sale event, there are some important things to know about vesting upon change of control. When a sale event happens, your vested stock or options will become liquid (or at least will be “sold” for cash or exchanged for acquirer’s securities). Your unvested stock and options will not. Many times the acquirer assumes the stock or option plan and your unvested equity will become unvested equity in the acquirer and will continue to vest on your established schedule. So sometimes a company will offer accelerated vesting upon a change of control to certain employees. This is not generally done for the everyday hire. But it is commonly done for employees that are likely going to be extraneous in a sale transaction. CFOs and General Counsels are good examples of such employees. It is also true that many founders and early key hires negotiate for acceleration upon change of control. I advise our companies to be very careful about agreeing to acceleration upon change of control. I’ve seen these provisions become very painful and difficult to deal with in sale transactions in the past. And I also advise our companies to avoid full acceleration upon change of control and to use a “double trigger.” I will explain both. Full acceleration upon change of control means all of your unvested stock becomes vested. That’s generally a bad idea. But an acceleration of one year of unvested stock upon change of control is not a bad idea for certain key employees, particularly if they are likely to be without a good role in the acquirer’s organization. The double trigger means two things have to happen in order to get the acceleration. The first is the change of control. The second is a termination or a proposed role that is a demotion (which would likely lead to the employee leaving). I know that all of this, particularly the change of control stuff, is complicated. If there is anything I’ve come to realize from writing these employee equity posts, it is that employee equity is a complex topic with a lot of pitfalls for everyone. I hope this post has made the topic of vesting at least a little bit easier to understand. The comment threads to these MBA Mondays posts have been terrific and I am sure there is even more to be learned about vesting in the comments to this post. Options are an incentive to stick it out and to share in the rewards for completing the mission. If the VCs are headed to the exit w/ a pocket full of loot, it is only fair that the employees and management who have made that possible are similarly rewarded with the same bountiful liquidity. When anybody goes to the pay window, everybody goes to the pay window. If everybody cannot go to the pay window, then nobody goes to the pay window. Simple fair concept like the law of gravity. How do you feel about founders being forced to put their (already owned) stock into a vesting schedule as a condition of financing? This article was originally written by Fred Wilson on November 15, 2010 here. Next post Employee Equity: How Much?